This make-ahead dessert is great fun for summer parties or family desserts. 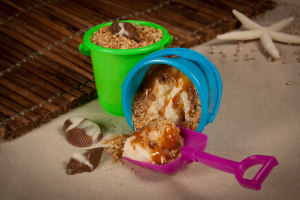 In each bucket, layer 1 cup frozen yogurt, 2 tablespoons butterscotch-caramel topping and 2 tablespoons cinnamon graham cracker crumbs; repeat layers ending with graham cracker crumbs. Dessert may be eaten immediately or frozen at least 1 hour. If eating immediately, decorate with gummi and chocolate candies. If freezing, decorate just before serving. Indulge in this decadent ice cream dessert without guilt by using reduced fat and sugar ingredients. Spread 1 tablespoon peanut butter on top of each ice cream bar. Top each with about 1 tablespoon diced banana. 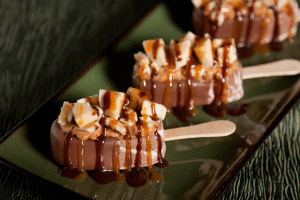 Crumble 1 cracker on each and drizzle with 1 teaspoon caramel syrup and 1 teaspoon chocolate syrup. Serve immediately. 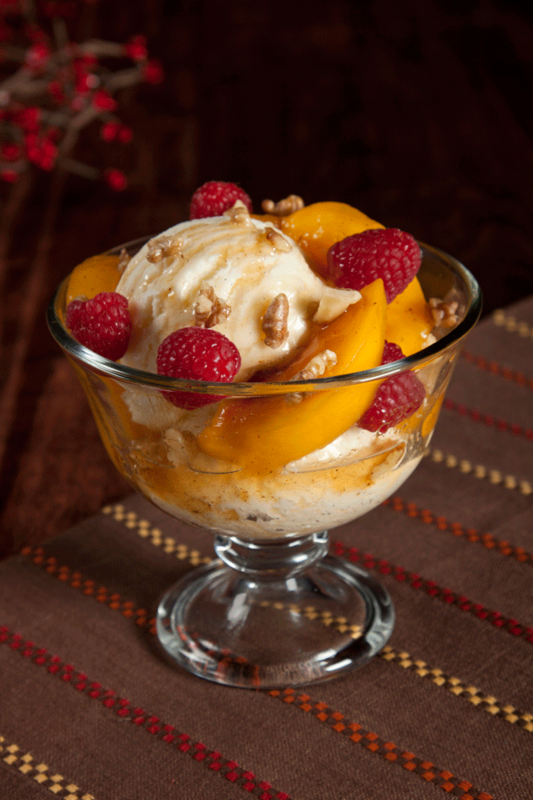 Warm, honey-sweetened fresh peaches are the perfect complement to frozen vanilla bean yogurt. In a medium skillet over medium heat, cook walnuts until toasted, about 5 minutes; stirring constantly. Cool. When cool enough to handle, very coarsely chop. Set aside. In same skillet over medium heat, combine peaches, honey, cinnamon and cloves; cook and stir until peaches soften. Cool several minutes, then spoon over frozen yogurt. Top each serving with walnuts and about 4 raspberries. Serve immediately. A delectable combination of brownie, white chocolate, and peanut butter, these luscious squares are sure to satisfy any sweet tooth! Bake brownie mix according to package directions using a 9 x 9-inch baking pan; cool completely. Melt white chocolate in medium bowl according to package directions. Stir in 1/2 cup whipped topping; cool to room temperature. Fold in remaining whipped topping. Chill 1 hour. 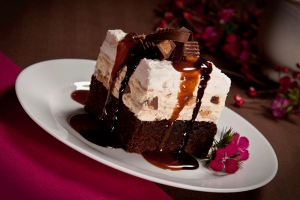 Spread ice cream over brownies. 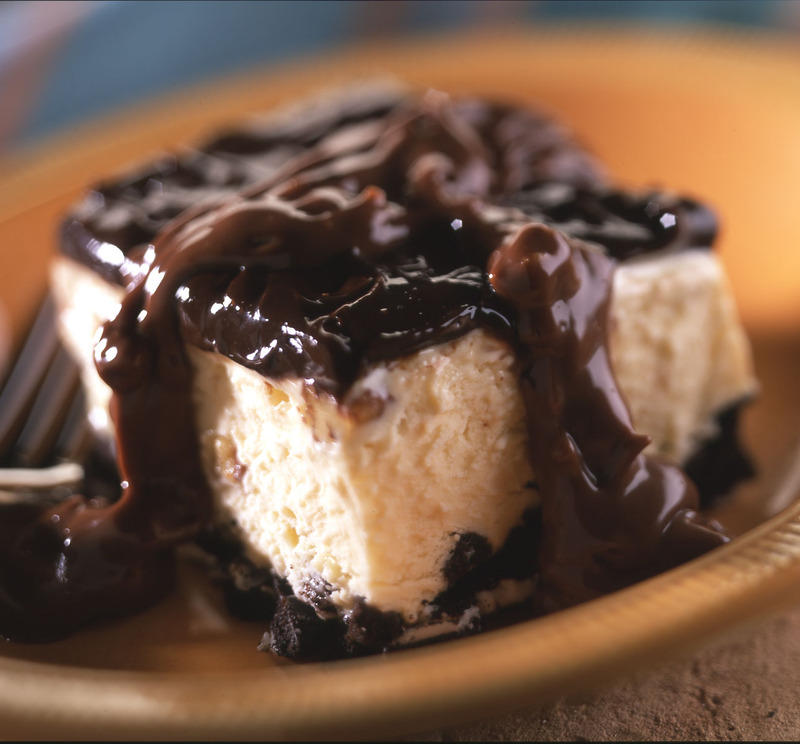 Spread mousse over ice cream. Freeze at least 4 hours, until solid. Cut into squares, garnish as desired. Blue Bunny Premium Chef Duff 24 Karat Carrot Cake™ flavored ice cream, carrot cake and glazed apples combine to create a luxurious pie. 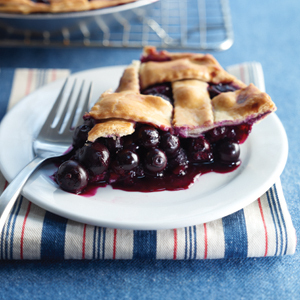 Spread softened ice cream evenly in pie crust; cover and freeze at least 4 hours or until solid. Ten minutes before serving pie, remove pie from freezer; uncover and set aside. Thinly slice apples, leaving peeling on. In a large non-stick skillet over medium heat, toss apples with lemon juice and 2 tablespoons caramel syrup. Cook just until apples soften but still maintain their shape, about 10 minutes, turning often. (If necessary, remove apple slices to a bowl as they cook to prevent overcooking.) 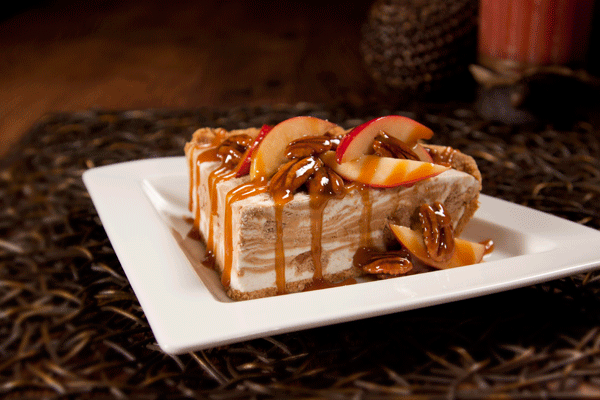 Cut pie into 8 slices; top each with about 1/3 cup glazed apples. Drizzle with caramel syrup and sprinkle with broken pecans. Serve immediately. This impressive ice cream dessert is so simple to make and will bring squeals of delight from your family. 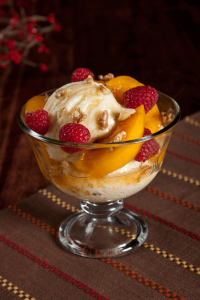 For each dessert, spread 2 tablespoons Premium Vanilla ice cream into the bottom of a martini glass. Top with 3 tablespoons Orange Sherbet, spreading smooth, and 3 tablespoons Pineapple Sherbet, spreading smooth. Place in freezer while assembling remaining servings. 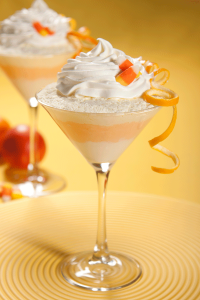 Just before serving, top each with 1 tablespoon whipped topping and 2 candy corn candies. Serve immediately. To make ahead: layer ice cream and sherbet in each martini glass; cover and freeze until serving time. Top each with whipped topping and candy corn just before serving. Chocolate sandwich cookies, pecan patties, hot fudge, and Blue Bunny® Sweet Freedom® Butter Pecan Ice Cream make a delightfully decadent treat! Coarsely break sandwich cookies into chunks; place in bottom of an ungreased 8 inch square baking pan. Spoon softened ice cream over cookies; spread evenly. Heat fudge topping according to package directions; pour over ice cream. Freeze until solid, about 2 hours. In a small saucepan over low heat, combine caramel pecan patties and half and half. Cook, stirring constantly until caramel patties are melted and mixture is slightly thickened. Stir in vanilla and salt. Cool 15 minutes before serving. 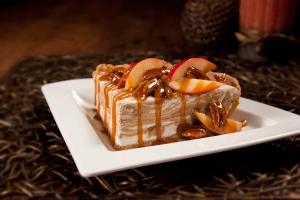 Cut dessert into 12 squares; topping each with 2 teaspoons of caramel sauce. Store remaining caramel sauce in refrigerator. To rewarm sauce: microwave in a microwave-safe container on high 45 seconds or until pourable. Preheat oven to 450°F. Line a roasting pan with foil; add 2 cups water to pan. Place turkey on a roasting rack and set in roasting pan; rub top of turkey with oil. In a small bowl combine brown sugar, paprika, cumin, cayenne, and salt to taste. Rub on turkey. Roast turkey, uncovered, 30 minutes. Reduce heat to 400°F. Cover turkey loosely with foil and roast 40 minutes more or until an instant-read thermometer registers 165°F. 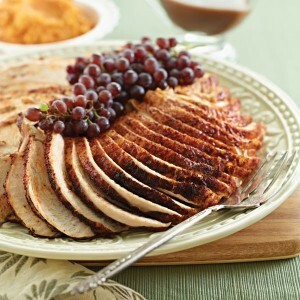 Transfer turkey to a serving platter; reserve 1/4 cup of the drippings (fat skimmed). Cover turkey loosely with foil to keep warm. Let stand 15 minutes. Meanwhile, for the gravy, in a medium saucepan melt 1/2 tablespoon of the butter over medium-low heat. Add shallots; cook 3 minutes or until softened. Add broth, wine and reserved drippings; bring to boiling. Cook until reduced to 1 3/4 cups. In a small bowl dissolve cornstarch in 2 tablespoons cold water. Whisk into saucepan; cook and stir 1 minute. Remove from heat; whisk in remaining 1 1/2 tablespoons butter, and salt and pepper to taste. Slice turkey and serve with gravy. For the vinaigrette, in a small bowl whisk together vinegar, oil, mustard and honey. Season with salt and pepper to taste. Set aside. Bring a large pot of salted water to boiling. Add beans; cook 2 minutes. Drain, then immediately place beans in a large bowl of ice water. Let stand in ice water 3 minutes. Drain; transfer to a large serving bowl. Pour vinaigrette over beans. Add shallots; toss to combine. Sprinkle with cheese and walnuts and serve. 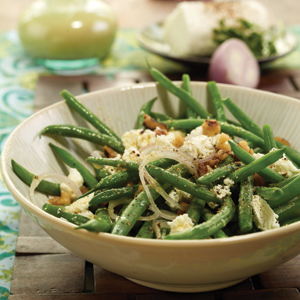 **Or use snap beans if French beans are unavailable, and increase cooking time by 2 minutes. Preheat oven to 375°F. Coat a large baking pan with nonstick cooking spray. In a small bowl combine panko, seasoning, and oil; set aside. Spread pesto evenly on the underside of each fillet. Place 1 cheese piece horizontally across the narrow end of each fillet. Place several tomato pieces next to cheese. Starting with the narrow end, roll up fillets over filling; secure with wooden toothpicks. Press the tops and sides of pollock rolls into panko mixture. Place on baking pan. 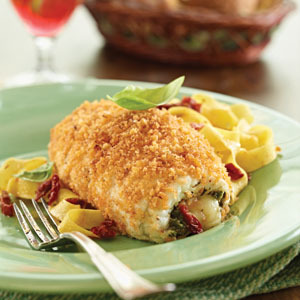 Bake 20 minutes or until fish flakes easily with a fork. Serve warm. Preheat oven to 350°F. Coat an 8×4 1/2-inch loaf pan with nonstick baking spray. In a small saucepan over medium heat combine 1 cup of the milk plus sugar, butter, and molasses; bring to boiling, stirring occasionally. Remove from heat; stir in grated ginger. Set aside. In a large bowl combine flour, baking soda, ground ginger, cinnamon, and cloves; stir to combine. Gently stir in milk mixture, stirring just until combined. Pour into pan. Bake 45 minutes or until a wooden toothpick inserted into the center comes out clean. Let cool 20 minutes in pan on a wire rack. Remove gingerbread from pan; let cool completely. Meanwhile, for the glaze, in a medium bowl whisk together powdered sugar, remaining 1 tablespoon milk, and vanilla; add more milk to thin, if needed. 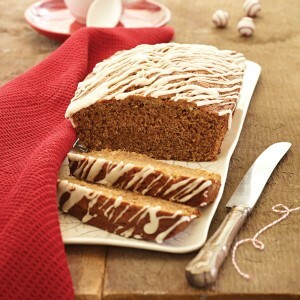 Drizzle gingerbread with glaze. Let stand 30 minutes before slicing. 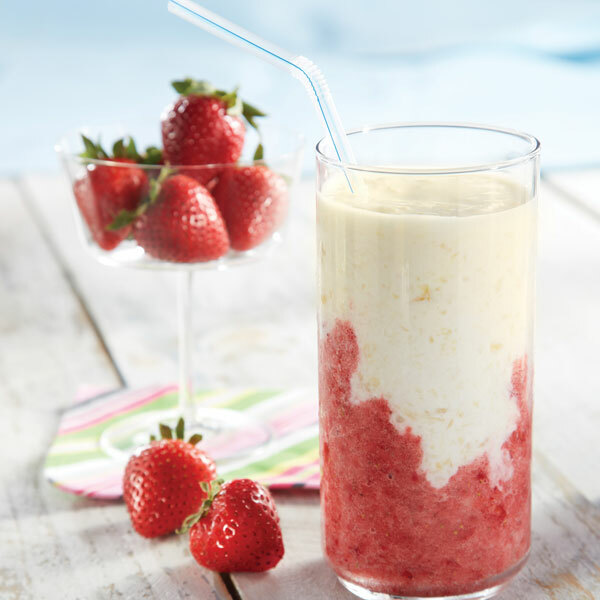 For the strawberry layer, in a blender combine strawberries, sweetener, and 10 ice cubes; blend at high speed until smooth. (Add additional ice cubes for a thicker smoothie.) Pour into 3 glasses and freeze while preparing next layer. For the pineapple layer, rinse out blender container. Add yogurt, pineapple, sweetener, coconut extract, and 10 ice cubes; blend at high speed until smooth. (Add additional ice cubes for a thicker smoothie.) Pour over strawberry layer and serve immediately. * For a vegan smoothie, substitute a non-dairy plain yogurt for Greek yogurt. disclaimer: Note: For gluten-free recipes, carefully read product labels when selecting ingredients. Preheat oven to 425°F. Coat a deep-dish pie plate with nonstick baking spray. Line with 1 pie crust. Roll the other crust into a 12-inch circle; cut into 10 strips 3/4-inch wide. Set aside. Place blueberries in a large bowl. In a small bowl combine brown sugar, cornstarch, orange zest, and extract; mix well. Add to blueberries; toss to coat. Pour into pie crust. Place 5 pastry strips on top of berries in vertical rows. Weave the remaining 5 strips horizontally through the vertical strips. Seal all of the strips to edge of crust, crimping with fingers or a fork. Place pie on baking sheet. Bake 20 minutes; reduce temperature to 350°F. Loosely cover with foil; bake 30 minutes more or until juices are bubbling and thickened. Remove from oven; remove foil. Let cool completely before slicing. Serving suggestion: Serve with vanilla ice cream and coffee or tea. Coat grill rack with nonstick cooking spray. Preheat grill to high (400°F to 450°F). For the salsa, in a medium bowl combine black-eyed peas, bell pepper, tomatoes, and onion. Season with salt and pepper to taste. Set aside. Liberally sprinkle one side of fillets with Cajun seasoning; set aside. Coat a large sheet of heavy-duty foil with nonstick cooking spray. Crimp edges of foil to form a pan. Place foil pan on grill rack. Place fillets, seasoned side down, on foil. Grill, covered, 3 to 4 minutes per side or until fish flakes easily with a fork. 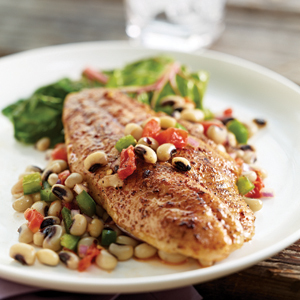 Spoon black-eyed pea salsa on fillets and serve. recipe notes: Make it a meal: serve with cornbread and sliced watermelon. For the sauce, in a small bowl stir together teriyaki sauce, vinegar, sesame oil, red pepper flakes, and salt and pepper to taste; set aside. In a large skillet heat grapeseed oil over medium-high heat. Add bell peppers; cook and stir 4 minutes or until crisp-tender. Add scallops and ginger; cook and stir 2 minutes. Add green onions; cook 1 minute or until scallops are opaque and firm. Stir in sauce; cook 1 minute. Spoon rice into 4 individual bowls. Spoon scallop mixture over rice and serve. Put erythritol, stevia, and xanthan gum in a blender; process until a fine powder. Let set briefly so powder settles. Add chocolate and vanilla. Heat 1 cup milk until hot but not boiling, add to blender and cover; let stand 2 to 3 minutes to soften chocolate; process until chocolate is melted. Add remaining (cold) milk and butter; cover and blend on high until frosting thickens and is smooth, scraping sides, if necessary. Mixture will thicken slightly as it sets and will thicken more if chilled. *Stir in additional milk to desired consistency. In a large salad bowl, combine the amino acids, orange marmalade, rice vinegar, sesame oil, and ginger; stir to combine. Add Kim Chi, mix well. Add spinach and radishes; toss well. Sprinkle with nuts. *If desired, dressing amount can be doubled for a more heavily dressed salad. In a large skillet or electric skillet over medium heat, cook hash browns, onion and garlic in coconut oil until hash browns are golden, turning several times. Add mushrooms and cook several minutes, just until they begin to soften. Top with spinach and tomatoes; press 6 depressions in spinach mixture and crack an egg into each. Cover and cook 3 to 5 minutes until eggs are desired doneness. Season to taste with red pepper flakes, seasoned salt, and pepper. Serve immediately.